I am morphing into the sort of on-line pundit I detest, the one who blindly puts his club before country. It�s a condition brought on by the appalling treatment of �Our Harry� Kane by the media and the army of couch coaches on the social network. All I hope as England go into the third match of the Euros against Slovakia is that Harry�s confidence has not been damaged by the withering welter of words as so-called experts poke around him like a pig at an auction. Surely critics should have learned that you never write Harry off. He has played a game and a half in the Euros, the first against a Russian team that put up a Stanlingrad-like defensive blockade and during which he was illogically charged with taking corner kicks. Then it was 45 minutes against lively Wales when he did appear heavy legged, as you would expect of a young player who has been over-stretched in the last 18 months. To read some of the descriptions of his performance you would think he had suddenly become a novice with no idea of tactics or finishing finesse. He must feel like kicking them where it hurts with the golden boot he collected just a few weeks earlier. There could still be a big part for Harry to play in these Euro finals, but the Spurs disciple ticking inside me wants him home fit and well and psychologically as well as physically right for the challenge of the new season. Strong vibes on the gossip vine suggests he could have two new team-mates to help him find the back of the net in �40-million pair Michy Batshuayi from Marseille and Southampton midfielder Victor Wanyama. I�ll believe it when I see them in Tottenham shirts, but it is obvious Spurs need reinforcements for a season in which the prestigious Champions League will take precedence even over the Premier League. As I write I hear reports that Wanyama is at Tottenham having a medical check The captain of Kenya will be a considerable force in the Spurs midfield with his authoritative play. Something all the European coaches will have been alerted to is that in Kyle Walker and Danny Rose Tottenham have two of the finest attacking full-backs in the game, and that Eric Dier has developed into a strong and reliable midfield anchorman. Then there is the sensationally gifted Dele Alli, whose subtle part in the smash and grab winning goal by Daniel Sturridge against Wales was largely overlooked by the eye-witnesses who do not have the benefit of my made-in-Tottenham spectacles. All in all our Spurs contingent have equipped themselves well on the European stage, and I am convinced Our Harry can still make an impressive impact. He just has to ignore the know-nowt keyboard warriors. The group stage of Euro 2016 approaches completion, but there are still plenty of games left for us to watch. If you are looking to predict the final scores, why not try our best football tipster. PETER McWILLIAM carried on the tradition started by fellow-Scot John Cameron of encouraging football that was smooth, stylish and sophisticated, and played along the ground. "It's a game of fit'ba not heed ba'" he was fond of saying in his strong Scottish burr as he watched contemptuously the teams who played the hump-it-high-and-long game, a crude version of what is known today as Route 1. He wanted the kick-and-rush style rooted out. We can, arguably, confer on McWilliam the title of Father of Spurs. His methods not only brought winning results but also had a huge influence on the thoughts and deeds of two future Tottenham legends, Arthur Rowe and Bill Nicholson. McWilliam arrived at the Lane in December 1912 at the age of 33, after an appalling injury had forced his retirement from a successful playing career with Newcastle United, where he was admiringly known by the fans as �Peter the Great.� A snake-hipped player, he was famous for introducing the 'McWilliam Wiggle', a move in which he would shimmy past defenders with a wiggle of his hips. He had started out with his local club Inverness Thistle before taking his talent to Tyneside in 1902, playing a key role in helping the Geordies win three League titles and reach four FA Cup finals. A stylish, upright left-half with a magic wand of a left foot, he won eight Scotland caps in the days when there were only a handful of international matches a year. Even I am not old enough to have seen him play, but from all accounts he was a player in the mould of that Rangers genius of the 1960s, 'Slim Jim' Baxter. His playing career came to an abrupt and painful halt when he was stretchered off with a horribly damaged leg while captaining Scotland against Wales in Cardiff in 1911. McWilliam, described as �a thoughtful, pleasant-mannered man,� made it known that he was interested in management, and Tottenham chairman Charles Roberts lured him to The Lane with the offer of a wage of �12 a week. He struggled to make an impact in his early days in charge, mainly because he inherited players who were past their best or unable to play with the sound technique that his style of play demanded. As war clouds were gathering in Europe, he uncovered in Arthur Grimsdell an even better wing-half than he himself had been, while Jimmy Seed shone at inside-right, and Bert Bliss and Jimmy Dimmock formed a potent left wing partnership. The squad was further strengthened by the arrival from Northampton of wee wizard winger �Fanny� Walden, along with assured right-back Tommy Clay, and the two Jimmys � Cantrell and Banks. War had already been declared when � despite all their new talent � Tottenham were relegated in bottom place in a 1914-15 season that most sensible people felt should have been abandoned. It seemed obscene to be playing football while thousands were dying on the battlefields in France and Belgium. McWilliam resumed control at White Hart Lane in 1918-19 as the unspeakable horrors of the First World War were laid to rest beneath a riot of celebration that turned the 1920s into what F. Scott Fitzgerald concisely and colourfully summed up as The Jazz Age. Peter completed his jigsaw by bringing in goalkeeper Alex Hunter, centre-half Charlie Walters, hard-as-nails right-half Bert Smith and specialist left-back Bob McDonald. An interlude here as I focus on the controversial circumstances in which Spurs found themselves after the wartime shooting finished and the football shooting recommenced. It will make Spurs fans see Arsenal red as we revisit an era when chicanery triumphed over chivalry. The Football League roared back into action nine months after the November 11 1918 Armistice, boasting of being �bigger and better� than ever. They expanded from 40 clubs to 44, with the First and Second Divisions now made up of 22 clubs each. The shock, particularly for Spurs, was that the restructured First Division included their new-to-North-London neighbours Arsenal � but not Tottenham. It was naturally assumed � with the extra places available � that the teams that finished in the last two places in the 1914-15 season, Chelsea and Tottenham, would automatically retain their First Division status, with Derby and Preston promoted as the top two teams in the Second Division to make up the 22 clubs. But nobody took into account the Machiavellian manoeuvres of Arsenal chairman Sir Henry Norris. He secretly negotiated behind the scenes and behind the backs, and had powerful Liverpool chairman and League president John McKenna � nicknamed �Honest John� � giving him surprisingly strong support. Despite finishing only fifth in the Second Division in 1914-15, it was Arsenal who were promoted along with Chelsea, Derby and Preston. The team that lost out was Tottenham, and all these years later it still rankles and irritates, like an itch that will not go away and the more you scratch it the worse it gets. Chairman Charles Roberts, who always apparently played by the book, was speechless, even apoplectic. Privately, the Spurs directors and � more vociferously, the supporters � were wondering just how �Honest� John McKenna was. Goodness knows what he would have been called had social cyberspace networks like Facebook and Twitter been around in those day. I think the internet might have exploded. It was not only Tottenham who felt left out in the cold. The stench carried all the way up through the Black Country and to the coalfields of Yorkshire. Wolves and Barnsley had finished third and fourth in the old Second Division, and they could not fathom how Arsenal had managed to leapfrog them without a ball being kicked. Norris, the man who stubbornly transferred Arsenal to Highbury from Woolwich against the wishes of most people in 1913, got the comeuppance wished on him by Tottenham. In 1927 the Football Association suspended him and a fellow director, and the club was censured for illegally inducing players, including the great Charles Buchan, to join Arsenal. Sir Henry became embroiled in a huge libel case against the FA and the Daily Mail, who alleged he had been using Arsenal funds to pay his personal expenses and the wages of his chauffeur. There was no hiding behind super-injunctions in those days. The newspaper produced evidence that he had pocketed �125 from the sale of the club team bus, endorsing the cheque with the forged signature of manager Herbert Chapman, and paying the money into his wife�s account. The cheers in Tottenham when he lost the case could no doubt be heard all the way to the Law Courts. Norris, whose ancestor had been beheaded for � euphemistically � flirting with Anne Bolyen, fitted the image of a Victorian villain, complete with a huge twirling moustache and a monocle that distorted his features. A former Conservative MP, Mayor of Fulham and chairman at Craven Cottage when he tried to merge the club with Woolwich Arsenal, Norris was drummed out of football for the rest of his life. Arsenal, the team he talked and tricked into the First Division, has been at the top table ever since � without ever earning the right to a place on the field of play. Here comes that itch again. 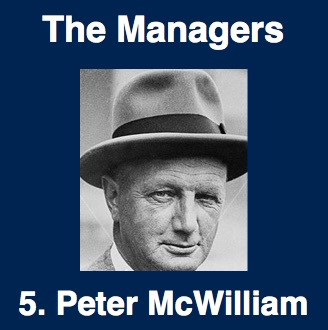 These shenanigans gave Tottenham the motivation to win a First Division place through playing rather than politicking, and in Peter McWilliam they had the man with a plan and the players to implement it. The on-fire Lilywhites ran away with the Second Division championship in 1919-20 with an avalanche of 102 goals and a six-point advantage over runners-up Huddersfield (this, of course, in the days of two points for a win). Their collection of 70 points from a possible 84 was a Second Division record and the best in the Football League for twenty-seven years. The terraces of football grounds heaved with huge crowds as the game in England rivalled cricket as the national sport. The only time the crowds would ever be bigger was immediately after the next little World War dust-up, but the Roaring Twenties promised peace and progress � except with the blind and bland rulers of the Football Association and the Football League. They obstinately reigned over a shameful age of soccer slavery, with the players treated like servants; the complete opposite of today's pampered, over-rewarded footballers. Surely somebody has to find a middle-ground compromise between slavery and avarice. As well as contracts that bound them hand and foot to their clubs, the players were told at the start of the 1922-23 season that the maximum wage was going to be cut from �9 to �8 in the season, and �6 to �5 in the summer. Strike action was threatened, but it proved an empty threat. The wages chop was forced on the players because of the entertainment tax, introduced to help pay off war debts as the Government cashed in on the game drawing record attendances. There were a spate of injuries and even deaths caused by over-crowding at grounds, and in a bid to keep spectator numbers down and lessen the chances of mass injuries, the FA increased prices for the 1921 FA Cup final between Tottenham and Wolves at Stamford Bridge. It cost a guinea (21 shillings, �1.5p) for the best seat in the house, and two shillings to stand. The match still drew a capacity crowd of 72,805 and record receipts of �15,400. It was the wettest final on record, with everybody getting soaked by a non-stop downpour. Newly promoted Tottenham, with skipper Arthur Grimsdell, Jimmy Seed and left wing partners Bert Bliss and Jimmy Dimmock in dominating form, kept their feet better on the quagmire of a pitch. �Dodger� Dimmock scored the only goal eight minutes into the second-half to make Tottenham the first southern winners of the Cup since they first won it twenty years earlier as a Southern League club. Spurs finished sixth in the First Division that season. A year later they were runners- up to Liverpool, and went out of the FA Cup at the semi-final stage against Preston after having a perfectly good looking goal disallowed. The profits from the 1921 FA Cup run were ploughed into ground rather than team improvements. Archie the Architect Leitch designed split-level covered terraces at the Paxton Road end, and then two years later at the Park Lane end. This increased the capacity to 58,000, with room for 40,000 under cover. They also invested in buying the Red House restaurant at the front of the ground, which was converted into the club offices. But in a way White Hart Lane had become dressed up with nowhere to go. They managed to lose the man who had been their key to success when McWilliam was allowed to move to Middlesbrough in 1927 for what was then an astronomical salary of �1,500 a year. It made McWilliam the highest-paid football manager in the world. Arthur Rowe and, later Bill Nicholson, sat at his feet, listening and learning. They would put his principles into practice to bring post-war Glory-Glory years to Tottenham, and all with a nod of appreciation for what they had picked up from Peter the Great. He was an impossible act to follow, as his immediate successor found out to his cost. That�s for next week. Thanks for listening. As we patiently wait for the third Spurs Odyssey Quiz League to kick off at the start of next season, I am challenging you each week to a teaser test of your knowledge of Tottenham players, ancient and modern. Yes, you know-alls, it was big-hearted Michael Dawson, who joined Tottenham along with Andy Reid from Nottingham Forest. We look forward to welcoming ever-popular Daws back to the Lane next season with the Hull City team he helped push to promotion. First name drawn: Bryan Wright, a Hertfordshire-born Tottenham supporter for more than 40 years who now lives in Wiltshire. I will be sending Bryan a screen version of one of my Tottenham-themed books. Please email your answer by midnight on Friday to SOQLTeaser6@normangillerbooks.com You will receive an automated acknowledgement. You can purchase any of my books from me at www.normangillerbooks.com, including No 101 out this week: July 30 1966, Football�s Longest Day, the full inside story of the day England won the World Cup. I was there, and was the only journalist to get into the dressing-room after the final. All profits from my Tottenham-themed books go to the Tottenham Tribute Trust to help any of our old heroes who have hit difficult times.